casa Anna,center of Fira, balcony, ocean views. 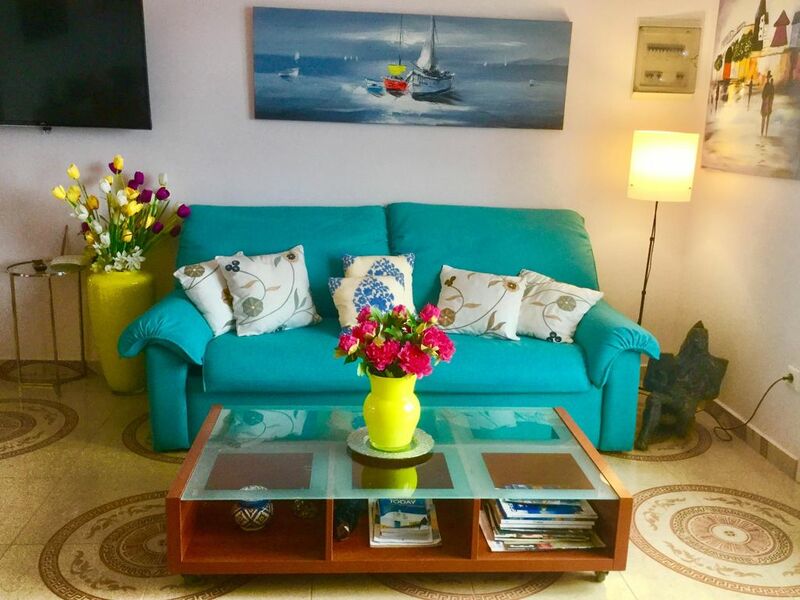 Casa Ana is perfectly located an easy couple minute walk from the main bus/taxi stands, restaurants, and bank in the center of town. We are only a couple minutes walk to a leisurely hike on the the world famous Santorini Caldera! Close by are numerous restaurants, a large supermarket, and an organic market. Casa Ana is newly renovated from top to bottom. Everything is new! As you enter Casa Ana, you are greeted by lovely Grecian floor tile work opening up into a spacious kitchen, dining and living area. . The balcony has a sunrise sea view to enjoy your morning coffee. The kitchen has all the amenities one could ever desire including a brand new Stove, Oven, Fridge, Microwave, Sandwich Maker, Electric Kettle, Filter Coffee Maker, Pots and Pans, Utensils, etc. The 2 bathrooms have stunning Grecian tile work with plenty of linens provided (including luxurious bathrobes). Both newly renovated bathrooms have "rain" shower fixtures to relax under after a long day of exploring, or if you prefer, there is a bathtub jacuzzi to relax in. A large sofa in the living room converts easily in a double bed! For your convenience, we provide transfers to and from the airport or ferry port, escorting you to your doorway. Our rates are significantly less than a taxi. We are also happy to to offer friendly suggestions on what to see, what to do, where to eat, where to change money, etc. We truly await the pleasure of having you stay in Casa Ana! We live and work in Santorini thirty two years,love this island and recomand to all of you . Santorini is magical! toilet, shower, There are two shower in this bathroom. There are two bathrooms, Three showers. The water get hot from solar systems. The house is overlooking Santorini island and the ocean,perfect sunrise! The house has an amazing location on the main street in Fira, close to everything and easy for evenings walks, restaurants , bus station, etc. Is very clean and cozy and full of color and light / The 2 baths were a bonus for us traveling with our teenage kids. The owner was so lovely and eager to accommodate us. We loved everything about it! Good location in Fira. Suitable for families. Close to center of town in Fira. Suitable for families. Owner, her son and daughter were responsive and helpful. Cute little place and centrally located. The host was awesome with all the arrangements and advice. We got to the place earlier than expected and they made all effforts to have the place ready for us. Close to bus station, shopping, night life, and great food. Great location if you cannot overlook the crater side. Service by owner was very nice too. Full service laundry was convenient and market, bakery and bus stop close too. We had a wonderful fime in Santorini. This was the perfect place to stay. A big, clean space in a perfet location. In the center of town but stil quiet. Would gladly stay there again. Great location! Very clean and comfortable. Casa Anna was centrally located and perfect for our stay in Santorini. It was very clean, light and bright, and comfortable. There's a small laundry downstairs and Matilda helped us with many things such as taxis, directions, and clean fresh towels. I would definitely recommend Casa Anna to anyone staying in Fira. This house is located in the center of action . Just few steps from famous caldera views.. The house should be clean of trash on guest departure,kitchen wear clean . The electricity expenses are included in rental cost but guests should keep all electric devices like,lights,aircondition in off position when they are out. Thank you for your understanding.